There is at least one Sudoku or Puzzle Competition held every week across the world. Good news is that to participate in most of these competitions one don't need to travel anywhere. If someone is having internet connection and printer, he/she can participate in these championships online sitting at their home. Earlier we used to list these championships every week. However this practice is stopped from year 2016. However here is the list of all these championships. As this list is very big, puzzle championships listing is divided into two parts. This post lists puzzle championships starting 2012. 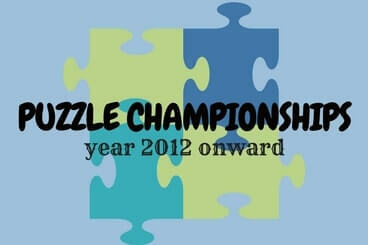 Do checkout our previous post on Puzzle Championships, if you want to look for puzzle competitions before year 2012.